Situated on the quiet street of 17th St N is this recently renovated home. It features 3 bedrooms and 1 bathroom with 1,312 square feet of living space to enjoy. It also has a pool! This home has been thoroughly updated. New tile flooring, new kitchen fixtures and appliances, new water heater, windows, and doors. The new roof was installed in 2016. 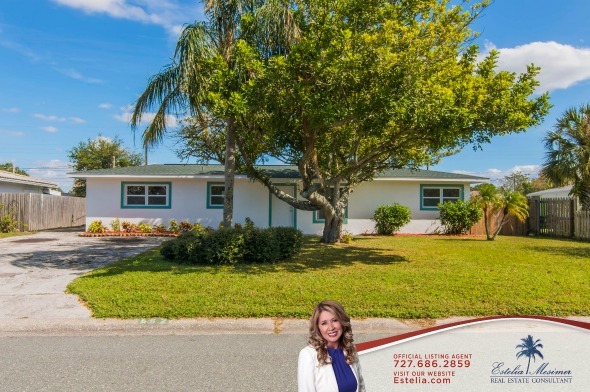 With its updated great room, kitchen, bedrooms and deck, this Saint Petersburg home has been properly maintained and taken care of, perfect for new couples or if you are seeking to downsize. It is located in Meadow Lawn, a beautiful residential community. You’ll love its proximity to shopping, recreation, and the short commute to Tampa Bay. It is also only minutes away from Sawgrass Park where you can bike, bird watch, hike, and picnic. Enjoy the bright and cheerful ambiance of this home’s open floor plan. Step into a bright and lovely great room with big windows that let in plenty of natural light. With its freshly painted light colored walls and new floor tiles, you have a stunning setting for your choice of seats. To the right of the room is the living area. The big windows overlook the lush front yard and street. A well-chosen sofa set with a side table and lamp can turn this living room into a cozy spot, best for relaxing and welcoming friends and guests who are visiting. The sliding doors on the other side of this living area provide a relaxing view of the pool and backyard. To the left side of the front door is the recently renovated compact kitchen. It features new appliances, new granite countertops, and lots of upgraded cabinets. You will not lack storage space here. Along with this home, you also get the microwave, range, and refrigerator. Pursue your passion for cooking in this efficient and stylish kitchen, and fill this home with the aroma of your favorite foods. After a long day, nothing beats retreating into a cozy bedroom, and the bedrooms of this home for sale in Saint Petersburg are certainly that. Spacious and bright, this room exudes warmth and welcome, with its laminated wood floors and big windows. You also get an ample sized closet for your items. Turn this room into your sanctuary and indulge in a long, relaxing sleep. Wake up feeling refreshed and energized, ready for another day. The sliding doors in the great room open to a new wood deck and a beautiful sparkling pool. This patio is the best place for your barbecue grills. You can also set up a mini-bar in this area. This home’s pool is the star of the show. It is the perfect place for entertaining, and it’s a hit among people of all ages. Nothing beats having your family and friends over for swimming in the pool on a hot summer day! This backyard is fully fenced for privacy and can be yours for ONLY $228,500. Interested in this home or similar homes in Saint Petersburg? Visit www.Estelia.com for more information. 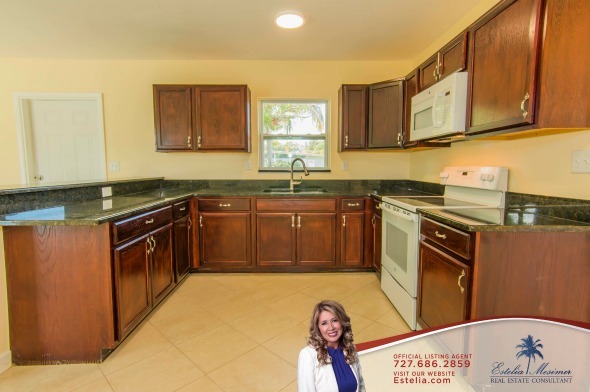 Call me, Estelia Mesimer, at (727) 686-2859 today. Let me help you find THE HOME that fits your budget and needs.